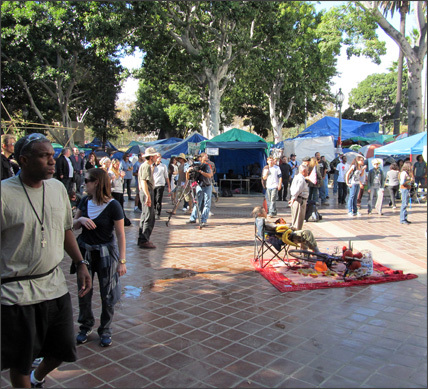 The Occupy Oakland and Occupy Wall Street camps have been cleared out, but American citizens have returned in greater numbers. Politicians, reporters and the protesters themselves are all saying that police raids have only strengthened the resolve of the movement. According to the BBC, there are 751 Occupy movements going on right now in major cities worldwide, with millions marching in solidarity with the 99%. Statistically, each raid by authorities just attracts more protesters the next day. Violent raids only give the Occupy movements greater publicity and even greater numbers. The positive part of me hopes for a giant voter turnout and significant government reform. The cynic in me expects artillery. I interviewed Ryan Rice, 27, who is a writer, media representative and roaming informed moderator for Occupy Los Angeles and the 99% Movement. He has also worked closely with Occupy Oakland, and was jailed along with the second military veteran, Kayvan Saveghi, who was injured by Oakland Police and left in his jail cell with a ruptured internal organ for sixteen hours without medical treatment. This interview will be broken up into two parts. How long have you been with the Occupy movement? The first pre-Occupy movement was September 22nd, at Pershing Square. It was just fifty of us getting together to decide what to do in solidarity with Occupy Wall Street. I’ve been on the ground since then. So far very few major news organizations have given you proper objective coverage, even though your crowds are much larger than the Tea Party gatherings that seem to attract a lot of attention. Did you expect the mainstream media’s reaction? I think for decades now the mainstream media has painted a picture that is beneficial to whom they really represent and are ultimately controlled by, from Rupert Murdoch to the corporations that dictate what they want the people to see. It can be changed by the existence of the Internet. We saw how social networking and social media was so effective during the uprising in Egypt, Tunisia, Syria…even Iran in 2009 with the Green Revolution. So the fact that the Internet exists is making the mainstream media obsolete. In some cases, the mainstream media has been portraying the Occupy movement in a lot of different ways. Tell me something about the Occupy movement that the public should know. Well, the media loves to highlight the problems that come with homelessness finding a place to live here. They like to highlight the violence. The reality is that this Occupy is a microcosm of the problems we’ve faced in our society for decades. If our existence is highlighting those issues, so be it. They need to be focusing on the issues we’re protesting and the substantive arguments we do have that hold weight. These arguments have held weight in the philosophical and academic realms forever. Nobody pays attention because these corporations squash that dissent, since the arguments are not coming from a place that means profits for them. Our arguments are coming from a place of sustainability and treating people with humanity, and that doesn’t help their bottom line. Would you say that the 99% Movement is the opposite, or perhaps a reaction to, the Tea Party? Or is this movement not necessarily an answer to the right? It is just a movement. The Tea Party has more in common with the Occupation that I think they are willing to admit, but their focus has been on small government. I saw an editorial comic that showed one group protesting a building that represents big business, and then the Tea Party protesting a building that represents big government, and the two buildings grow until it is the same building and both groups are just protesting the same power structure they’re both unhappy with. What does the 99% Movement have in common with the Tea Party? I think the Tea Party organically formed from a demand for small government, although having a small government and small social services is something to debate. They came up just like the Occupation movement out of a demand to be heard as a political voice. 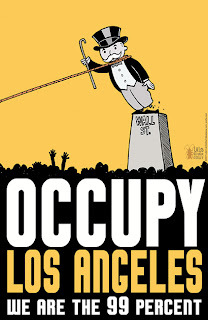 The media is now saying that the Occupy movement has to do something else. What do you think? We live in a 24/7 news cycle. To quote Jeremy Macquire, “We live in a cynical, cynical world.” This endless rush for headlines is what’s causing the mainstream media to demand that we do something. For me, there is no rush. This is about outreach and education. I don’t feel rushed to do something except have a conversation about what’s wrong with our country and our planet. The mainstream media loves a good headline. If they don’t get something flashy for their news cycle, it affects their bottom line. So they want us to do something flashy so they’ll make more money. The reality is, what we are doing is beginning the conversation. When Bank of America announced that they were going to charge their customers $5 a month to use their bank card, a lot of people were very angry. This highlighted a large part of the conversation the 99% Movement is beginning to have. Now, banks are backing off from the fee and the mainstream media is reporting that as a victory for Occupy Wall Street. On November 5th nearly a million people moved their accounts from banks to credit unions. If those two are victories, what to you would be the third victory for a cynical observer that might not believe Occupy Wall Street is making a difference? The most important victory is the drastic re-altering of how we view who controls the government. I think that the highlighting of corporate interests that are running the wars, running our prisons, running the distribution of our food, pharmaceuticals…the fact that we are now aware of the issue and are all discussing it, out in the open, is a victory. I think what we are trying to do is laying the foundation for a conversation about what industries should be for profit, like health care, education, the military, prisons, etc. The fact is, there are a lot of people making money from those industries. It’s a hard concept for people to wrap their heads around, about whether or not people should be making money off of these types of things. That goes back to the basic nature of how we create our society. It’s difficult for people to imagine a world that is drastically different from the one we live in. Do you think that the message the 99% Movement represents is too much for most people? I think it’s going to turn some people off and others might paint us as the quintessential hippy ideologues, but the reality is, with the access to the Internet and the fact that we are now having these conversations, these things are no longer some sort of pie-in-the-sky dream. We are now all connected in a way that can realistically change the system.